All GHS student GMAIL passwords have been updated prior to the beginning of the school year and laptop distribution this week. Students need to login to SKYWARD using their current password to get their new GMAIL password before Wednesday, August 1. All laptop/Skyward passwords will be reset prior to laptop distribution Wednesday. 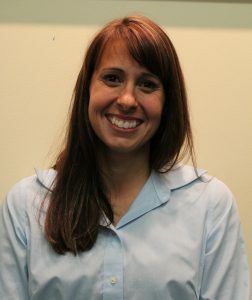 Dr. Daly holds a Bachelor of Science degree in Dietetics from Ball State University, and both a Master’s degree in Health Promotion and a PhD in Exercise Science from Auburn University. She has recently been working as a Quality Specialist, and has previous experience as a Food Service Director at a school corporation in Michigan. Dr. Daly brings a wealth of knowledge, education, and experience to her new role, as she oversees all of the schools in our district,. GCS anticipates continued, positive changes and direction in our school cafeterias as we begin the 2018-19 school year. Fejzić (FAY-zich), whose family left Bosnia in the early nineties and moved to the U.S. in 1999, experienced this ritual for ten years, and she understood that people in her new town weren’t used to names like hers, despite the fact that the area’s Bosnian population had grown massive in recent years. If you’re in a position to say lots of student names—in your classroom, over the P.A. system, or especially at awards ceremonies and graduations—no one will be surprised if you mess up a couple of them. But this year, maybe you can do better. If you make the commitment now to get them all right, if you resolve this time to honor your students with clear, beautiful pronunciation of their full, given names, that, my friend, will be the loveliest surprise of all. I grew up with a hard-to-pronounce name. Actually, it wasn’t that hard; it just looked different from what people were used to: Yurkosky. (Kind of rhymes with “Her pots ski,” minus the “t” in pots.) Year after year, it threw everyone off. And the way they approached the name put them into one of three camps: fumble-bumblers, arrogant manglers, and calibrators. The fumble-bumblers I didn’t mind so much. They’d mispronounce the name, slowing down and making their voice all wobbly, not trusting themselves. They’d grimace, laugh, ask me how to say it, then try again. But then they sort of gave up. Over the next few attempts, they’d settle into something that was a kind of approximation, and that would be that. What made me not mind these people was that they put the mispronunciation on themselves—their demeanor suggested the fault was with them, not me or my name. Finally, there was a small group I think of as the calibrators, people who recognized that my name required a little more effort. They asked me to pronounce it, tried to replicate it, then fine-tuned it a few more times against my own pronunciation. Some of them would even check back later to make sure they still had it. If you’re already a calibrator, keep up the good work. If you’re not—if you’ve let yourself off the hook with some idea like “I’m terrible with names”—know that it’s not too late to turn things around, and it does matter. Though it may seem inconsequential to you, the way you handle names has deeper implications than you might realize. People’s reaction to this issue varies depending on their personality. If your student has a strong desire to please, wants desperately to fit in, or is generally conflict-avoidant, they may never tell you you’re saying their name wrong. For those students, it might matter a lot, but they’d never say so. And other kids are just more laid-back in general. But for many students, the way you say their name conveys a more significant message. Name mispronunciation – especially the kind committed by the arrogant manglers—actually falls into a larger category of behaviors called microaggressions, defined by researchers at Columbia University’s Teachers College as “brief and commonplace daily verbal, behavioral, or environmental indignities, whether intentional or unintentional, that communicate hostile, derogatory, or negative racial slights and insults toward people of color” (Sue et al., 2007). In other words, mutilating someone’s name is a tiny act of bigotry. Whether you intend to or not, what you’re communicating is this: Your name is different. Foreign. Weird. It’s not worth my time to get it right. Although most of your students may not know the word microaggression, they’re probably familiar with that vague feeling of marginalization, the message that everyone else is “normal,” and they are not. This issue goes beyond names rooted in cultures unfamiliar to the speaker. Whatever it is your student prefers to be called, it’s worth the effort to get it right. I’m sure I’ve not only mispronounced my own students’ names, but I’ve probably also called them something that was not their preference—realizing in April that the kid I’ve been calling Stephan all year actually prefers to be called Jude. And before you get all defensive about the bigotry thing, let’s be clear: Discovering that something you do might be construed as bigotry doesn’t mean anyone is calling you a bigot. It’s just an opportunity to grow. An opportunity to understand that doing something a little differently shows others that you respect them. At some point in your life, someone probably taught you to hold the door open for the person coming in behind you. Before then, maybe you didn’t know. Opportunity to grow. It’s that simple. The best way to get students’ names right is to just ask them. Pull the kid aside and say, You know what? I think I’ve been messing up your name all year, and I’m sorry. Now that graduation is coming, I want to say it perfectly. Can you teach me? By humbling yourself in this way, you let them see that you’re human. You’re modeling what it looks like to be a lifelong learner, a flexible, confident person who is not afraid to admit a mistake. Regardless of the outcome, a genuine effort on your part will mean so much, and when the big day comes, they might even root for you to get it right. If you’ve run out of time to ask students themselves, or if doing that is too uncomfortable for you, you can get some help online. On Hear Names, short voice recordings made by native speakers from each name’s country of origin pronounce the name for you. Whatever you do, do something. For some students, you may be the first person who ever bothered. 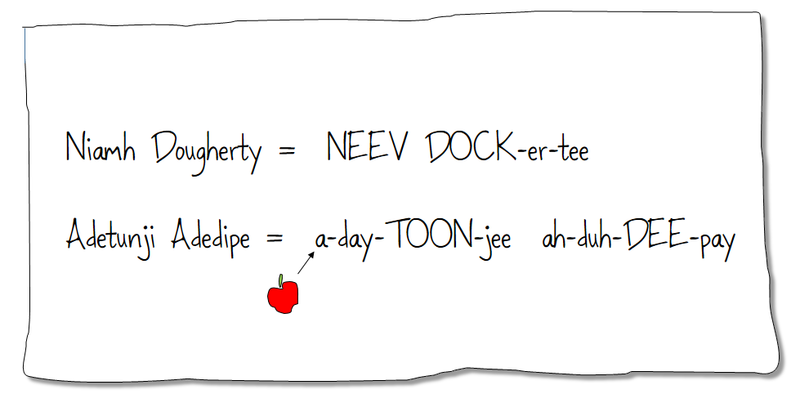 If the only time you say their name is in the classroom, your correct pronunciation will help the whole class learn it, too. Eventually that will ripple through the school, making that student feel known in a place where before they felt unknown. We are happy to announce a more convenient way of completing the annual summer mailing forms, through Skyward Family Access. In Skyward Family Access, you can complete on-line forms for your student as well as access grades, attendance, discipline, and much more. For instructions, go to skyward.goshenschools.org and click on “Skyward Family Access Help.” Online forms are saved with your student’s record and immediately available to school staff. This is a “test” year for the online option, if you have students in other schools besides West Goshen and GHS you will need to complete the paper version for them. Estamos muy contentos de anunciarles que ahora contamos con una manera más conveniente de completar el paquete que mandamos por el correo durante el verano a través de Skyward Family Access. En Skyward Family Access, usted puede completar todas las formas, tener acceso a las calificaciones, asistencia, disciplina y mucha más información de sus estudiantes. Para revisar las instrucciones, vaya a skyward.goshenschools.org y haga clic en el ícono “Skyward Family Access Help”. La información que se complete en las formas se guardará en el archivo de su estudiante y estará inmediatamente disponible para el personal escolar. Las formas que se pueden descargar están localizadas aquí here. Si prefiere imprimir y llenar las formas en papel, busque el paquete bajo “GHS Packets”. A partir del 16 de julio, el paquete completo también se puede recoger en la Dirección Escolar de lunes a jueves de 7:30 am. a 4:00pm. Los paquetes que se completen a mano se pueden entregar el día de la distribución de las computadoras portátiles (laptop) en agosto. Come enjoy the opening day of the Elkhart County 4-H Fair with your family! All students and employees of schools will receive free admission into the fair with a current/valid school/district ID, a letter signed from the Principal’s Office at your local school on school letterhead OR a copy of a 2017-2018 report card. These items can be presented at the Education day tent located at Gate G.
GCS teams, clubs, classes, families or friends: If you are looking for a way to raise money, check out this innovative fundraiser that will also help clean up our county! Citizens of Elkhart County have the opportunity to clean the county during this coming fall season while also competing to win $50,000 in cash prizes. The Elkhart County Commissioners and Solid Waste Management District are sponsoring a leaf-collecting competition, where the group collecting the most leaves from unincorporated areas will win the largest portion of the $50,000 cash prize. All groups that bring in three tons of leaves are guaranteed $1,000 in cash prizes, with the rest of the prizes being allotted based on groups’ final collection total. Registration begins today and ends on August 31; the competition occurs between September 10 and November 21. Since November 2017, plans have been forming on ways to combat the prevalence of leaf burning that occurs in unincorporated areas of Elkhart County. Smoke from burning leaves has negative impacts on public health and quality of place, especially in densely populated subdivisions. The competition is one of five pilot programs designed to address leaf burning in unincorporated areas of the county. Groups of any kind may register for the competition, as long as the primary contact person resides in Elkhart County and the group is not affiliated with a for-profit business. Admittance into the competition is on a first-come-first-serve basis, with a maximum of 25 participating groups. There is no entry fee to register. Only leaves collected in unincorporated parts of Elkhart County will be accepted. A consent form for each property where leaves are collected needs to be shown at time of drop-off to ensure that leaves were collected in unincorporated locations and that the property owner gave consent. Groups will receive their prizes by February 1, 2019. All rules are included in the registration packet and can be found at https://www.elkhartcountyswmd.com/leaf-collection-competition. For more information or to sign up, visit https://www.elkhartcountyswmd.com/leafcollection-competition. Questions can be directed to a.turner@sbenfocus.org. ○ There are two eligibility criteria for groups participating in the Elkhart County Leaf Collection Competition: (1) the group must not be affiliated with a for-profit business, and (2) the primary contact person must reside in Elkhart County. ■ Helpful tip! Are you unsure if your group is eligible to participate? Email a.turner@sbenfocus.org to discuss. ■ Helpful tip! There is no limit to the size of your group. If your group is small, consider collaborating with other groups so you can collect a larger quantity of leaves. ○ All members of the group must be participating in a volunteer capacity; they CAN NOT receive compensation for their participation in the competition. ○ There is no entry fee to sign up or to participate in the competition. ○ The sign up sheet must be completed and return emailed to a.turner@sbenfocus.org on or before August 31, 2018. The competition is limited to 25 groups, first-come-first-serve, so groups are encouraged to sign up early. ■ Helpful tip! Make sure your designated “contact person” is over 18 years old. ■ Helpful tip! 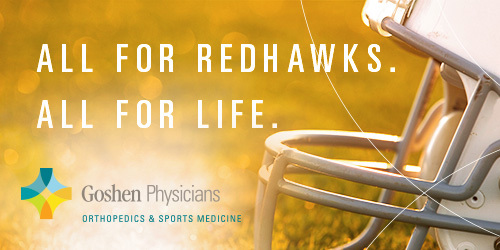 The sign up form asks if you’d like us to include your email on the Elkhart County SWMD Web site. This might help you identify homeowners who want their leaves collected as part of the competition. If you aren’t comfortable with having your personal email on the site, consider making a new email address specifically for the competition. ○ Groups can collect leaves from any resident located in unincorporated Elkhart County. Groups should NOT collect leaves from incorporated areas of Elkhart County where leaf collection is already provided (including the City of Elkhart, City of Goshen, City of Nappanee, Town of Bristol, Town of Middlebury, Town of Millersburg, and Town of Wakarusa). Any groups found collecting leaves from incorporate d areas will be disqualified from the competition and will not receive any prize.■ Helpful tip! Are you unsure if a property is incorporated or not? Look at our printable or online competition map (page 9 of this document) to be sure! Also, before you collect leaves from a property, ask the property owner if their municipality provides leaf collection services. ■ Helpful tip! Use your network of family and friends to identify residents that might welcome help collecting leaves. ○ Groups may NOT charge property owners or accept payment for their work. Additionally, groups may NOT pay property owners for leaves. Any groups found charging property owners , accepting payment for their work, or paying for leaves will be disqualified from the competition and will not receive any prize.○ Before collecting leaves, groups are required to get approval from the property owner and complete the other fields on the “Property Information Form.” Any group s that DO NOT receive approval from property owners before collecting leaves are trespassing, will be disqualified from the competition, and will not receive any prize. ■ Helpful tip! Groups could have property owners fill out the “Property Information Form” in advance, saving time during the leaf collection visit. ○ Groups can collect leaves using whatever method they see fit (raking, blowing, curbside pickup, etc). ○ The official competition dates will be from September 10, 2018 to November 21, 2018. Leaves dropped off at the landfill on one of the official dates, during posted business hours, will contribute toward your group’s collection total (“Collection Total”); leaves dropped off at the landfill at any other time will not contribute toward your group’s Collection Total. ■ Helpful tip: The Elkhart County Landfill is located at 59530 County Road 7, in Elkhart. The Landfill is open Monday through Friday from 7:00am to 4:45pm, and on Saturdays from 9:00am to 11:45am. ○ When arriving at the landfill window, be sure to state that you are participating in the leaf collection competition and the name of your group. Also, give the landfill staff member your completed Property Information Forms. ○ Place loose leaves in the public leaf pile as directed by landfill staff. Landfill staff will weigh your vehicle when entering and leaving the landfill, and will record the weight of the leaves in a spreadsheet. ■ Helpful tip: Be sure to follow all instructions from landfill staff. They are here to help! ○ Only leaves shall be dropped off at the landfill’s leaf pile. Any group s found leaving bags at the landfill, or dropping off significant quantities of other waste, will be disqualified from the competition, and will not receive any prize. ○ Feedback forms will be emailed to the contact person designated on your signup form before the competition begins ○ Please fill out feedback forms honestly and thoroughly. It will help us to make the competition better in the future! ■ Helpful tip: Don’t procrastinate. Consider filling out the feedback form as you go. ○ The feedback form must be completed and return emailed to a.turner@sbenfocus.org on or before November 30, 2018. Groups who do not complete and return feedback forms by this date will be disqualified from the competition, and will not receive any prize . ○ All participating groups that comply with competition rules and drop off at least 3 tons of leaves (“Threshold Amount”) will receive a “threshold prize” of $1,000. ○ Groups whose Collection Totals exceed the Threshold Amount, will have their excess leaves counted toward the “grand prize.” Groups exceeding the Threshold Amount will receive a pro rated share of the “grand prize” ($50,000 minus funds distributed as threshold prizes) based on their percentage of leaves, collected during the competition, that exceed the Threshold Amount.○ Any prize money a group earns will be paid to the contact person listed on the sign up form, and sent to the address listed on the sign up form, before February 1, 2019. From Battle Creek, MI: The Brass Band of Battle Creek (BBBC) is proud to introduce the 2018 Youth Brass Band Camp Participants. The Camp will take place July 16-20 at Marshall High School. The Camp will feature some of the world’s top brass musicians as faculty, and will conclude with a FREE public concert at Marshall High School at 7:00 p..m. on Friday, July 20th. “We are extremely excited this year to host this outstanding educational experience for high school bandsmen from across the Midwest!” Jeremy Root, BBBC Camp organizer and BBBC Director of Education and Outreach said. Root is also the band director at Marshall High School. “Those who attend will get a once-in-a-lifetime experience, an opportunity to learn from, and play with, the very best musicians today,” he added. The mission of the Brass Band of Battle Creek is “To bring joy, understanding and inspiration through the power of music.” This year will mark the fifth year of the Youth Brass Band Program and the second as a day camp. Presently, 40 students (including recent GHS graduate Josie Strader) are enrolled from throughout Michigan, Indiana, and Illinois, including many from Calhoun County and the program seems to be working well, Root said. A few of the former students, now in college, are returning to help out, “It’s exciting to see these students succeed in college after coming through our program,” Root added. The free concert, which is open to the public, will take place on Friday, July 20th at 7:00 p.m. at the Marshall High School Auditorium for Performing Arts and will showcase what these outstanding young musicians have learned. Please call 574-971-4149 with any address or phone number updates. Por favor de llamar al 574-971-4149 con cambios de dirección o numero de teléfonos. On June 28th GMS/GHS orchestra teacher Sean Patrick was one of four Indiana music educators sent to Washington D.C. to represent the Indiana Music Education Association in the national assembly. 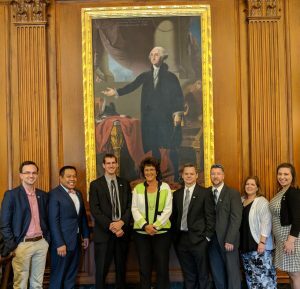 The educators were sent to D.C. to advocate for music education in our schools, by meeting with Indiana congressional representatives and senators. The picture attached is with Indiana 2nd district congresswoman, Jackie Walorski. The City of Goshen and the Goshen Municipal Airport will again host the annual Air Supremacy over Goshen remote control aircraft event, which will bring a weekend full of fun activities for everyone in the family. From Thursday, July 12, to Saturday, July 14, the municipal airport, 17229 Co Rd 42, will be host to more than 250 model aircraft of all sizes. More than 100 radio control craftsmen from all over the Midwest will be in attendance. Mayor Jeremy Stutsman and Airport Manager Randy Sharkey again encourage the community to this year’s event. Event coordinator RJ Monroe said he sees this event growing each year and attracting larger crowds. “With our move to Goshen Airport we have opened the door to become the premier event of its kind in the Midwest and the potential to become national in scope,” he said. This will be the sixth year that the Air Supremacy event has been held, though it’s the second year it’s been held in Goshen. The show features aircraft from WWI, The Golden Era, WWII, and the classics like the Piper Clubs and military-style turbine jets. Flying will be from 9 a.m. to 6 p.m. The event is open to everyone, for just $5 a person. Children under 12, veterans and military enter free of charge. There will be food and hobby vendors. Attendants are encouraged to bring their lawn chairs or blankets. For more information and an extensive photo gallery, please visit the Air Supremacy over Goshen website at www.flygoshen.com.